How many nose wheel gear legs have you installed on your plane ? My 2007 is on the third version. 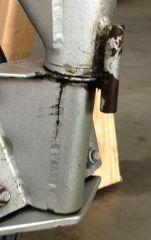 I think they are trying to modify the natural resonance of the gear by stiffening the gear leg. Natural frequencies are just as easily changed by reducing the stiffness. CA should do a finite element analyses (FEA) or a modal analyses I think they will find they are going the wrong way with the correction. Nose wheel leg cracks !! I would like to hear your take on the new CS mandatory bulletin about nose wheel cracking. It seems that if no cracks are found you must inspect the nose wheel leg every 4 take offs and landings and replace the nose leg $2000 part and ???Labor. at the next annual if no cracks are found. By the way Cruiser Aircraft will not help pay for this factory defect . Are you sure about this "if its in a newer plane no LOA needed?"